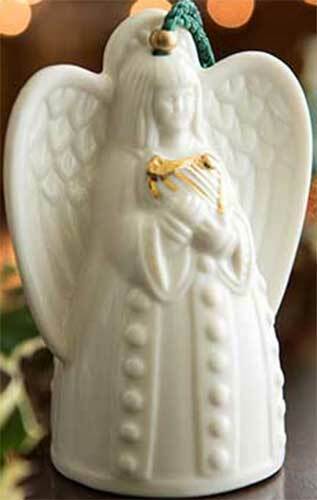 This Belleek angel ornament was introduced in 2015. This Irish angel ornament from Belleek China is holding a golden harp and is accented with a hand-painted green shamrock on the inside of her gown. This Irish Christmas ornament is a bell that is made of fine china; she measures 2 1/2" wide x 3 1/2" tall and is ready to hand with the included gold cord. 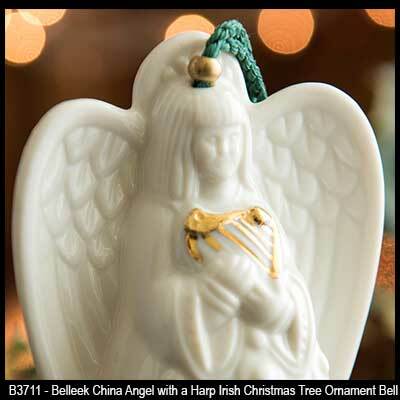 This Irish angel ornament is handmade and hand-painted in Belleek, Ireland and it is gift boxed with a shamrock history card, complements of The Irish Gift House.